There seem to be some misconception, perhaps mis-communication on the part of the communicator, but more than likely a misinterpretation of the interpreter - to interpret that having confidence, having a high self esteem, empowerment... somehow means carrying a chip on the shoulder. Being confident in oneself and having an ego are two separate and completely different things. One should not be confused with the other. Let's define the ego: it is an exaggerated sense of self-importance; conceit. 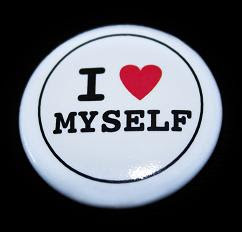 When we think of ego we often think of a person with an inflated opinion of himself (justified or not). On the other hand, what is confidence? belief in oneself and his/her abilities, self-assurance. See, the two are often times and easily confused. The egotistical and the confident person both like themselves. However, the confident likes himself based on what he IS and has a REALISTIC appreciation for his abilities. Simply put, he is real with himself, confident but not conceited. The line between confidence and the ego is breached when you realize your abilities as being above the rest and act negatively on it. You start to feel overly good about yourself to the point of disrespecting others, to the point of arrogance and conceit; you start to gather belittling thoughts of another, and in turn put yourself on a pedestal or turn your nose up. You might be smarter than others, more handsome, prettier, but it should not be made your duty to announce it to the world.You should be secure enough in your own attributes not to have to constantly make them known to others, or to have to prove your superiority. In the end this will only prove you are an insecure person who cares too much about how other people evaluate and see you. 101% agree. We, as a designer often face this problem : too much confidence and ends up of the result you've said. So being humble and knowing I'm only a dust in the universe can always help to keep my mind clear.